Blue Thunder, Elder, spiritual leader, and advisor, is an enrolled tribal member of the Eastern Shoshone Tribe, Wind River Indian Reservation, Ft. Washakie, Wyoming. He has many years of experience in indigenous tradition and culture with the Eastern Shoshone Tribe. Through the encouragement of his tribal elders, he studied Cultural Anthropology and Applied Indigenous Studies at Northern Arizona University in Flagstaff, AZ. Studying methods of communication at NAU has allowed Blue Thunder to speak from a truly Native American perspective and an indigenous viewpoint of what needs changing in the educational institutional classrooms. 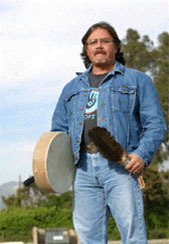 Blue Thunder is a member of the Spiritual Elders of Mother Earth, an organization of "indigenous prophecy seed carriers of North America" (http://www.spiritualelders.org). In this capacity, he helps educate Indigenous Nations and other cultures around the world on the significance of sacred sites and the indigenous prophecies. Blue Thunder believes there is a great need to undertake a thoughtful, visionary look at all sacred sites as part of a spiritual learning experience to regain harmony and relationship with ourselves and the earth. His present emphasis is to inform all cultures of the importance of sharing ancient knowledge and to preserve indigenous sacred sites across the world. Blue Thunder says, "There is a need for wisdom of the tangible and intangible spiritual aspects of all life, as well as a need to share ancient prophecy and work with natural Universal laws to be in balance and harmony with nature and all conscious life upon our sacred Mother Earth. At The Art Ranch, we hold these same goals; to help awaken this ancient knowledge in the children and adults who attend."